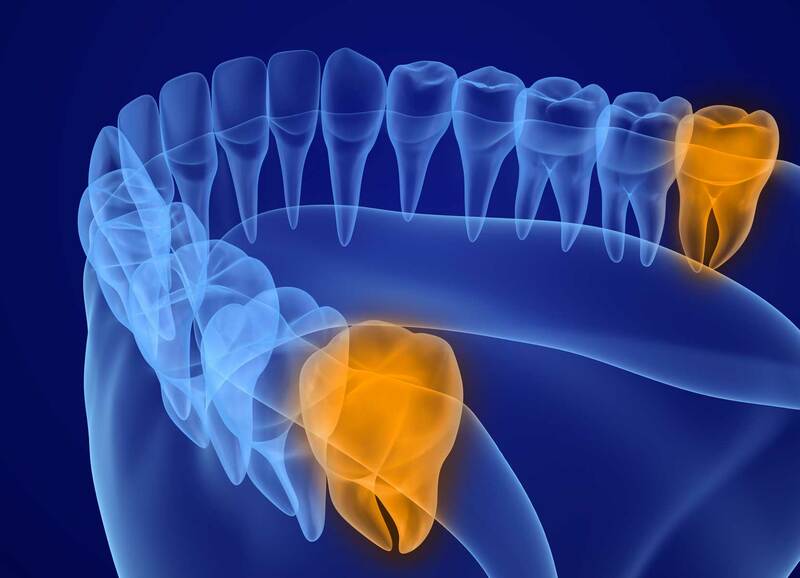 Wisdom teeth, known as third molars, are the last permanent teeth to come in, usually between the ages of 17 and 21. Removing wisdom teeth is often indicated due to the problems that they tend to cause. We, at Avalon Dental Care, perform this routine procedure at our office with a focus on your comfort and wellness, with full recovery typically taking only a few days. According to the American Dental Association, wisdom teeth extraction may be necessary if you experience pain, repeated infection in the soft tissue behind the lower last tooth, the presence of fluid-filled sacs called cysts, gum disease, extensive tooth decay, or damage to nearby teeth. Wisdom teeth often don’t have room to grow properly, causing a host of problems. They may come in at various angles in the jaw, sometimes even horizontally, pushing against surrounding teeth. They may emerge partially or be completely hidden within the gum (impacted), meaning they are trapped within your jaw. That can potentially cause significant pain, infection, or even damage to surrounding teeth roots and bone. Wisdom teeth may not have the needed room to come in correctly, crowding or damaging nearby teeth. Additionally, being so far back in the jaw, it’s often hard to reach your wisdom teeth to clean them properly, resulting in gum disease and cavities. If an infection is present, it’s best to remove your wisdom teeth. We perform wisdom teeth extractions with little to no discomfort with the use of local anesthesia or sedation options as needed. Following your oral surgery, we will provide you with instructions and will prescribe pain medication for use as needed. Following your procedure make sure to avoid smoking or drinking through a straw as instructed to avoid dislodging the clot forming in your tooth socket, which can result in a painful condition called dry socket. Recovery typically takes a few days. Visit us at Avalon Dental Care to learn more about wisdom teeth extraction and to determine the best treatment options for you. Our highly trained and experienced staff will offer you quality care with your comfort and well-being as our top priority. Call us today!